Small Stream Reflections: Sunday Morning......."Tiger"
What a great fish, he has made that stream his home for quite some time. Can't wait to read the story of when you catch him on the bomber! I would love to see that brook trout rise to the Bomber. Although I think he prefers fish. Another big one! Nice job. Looks like you were down my way again. I have also seen that largemouth. He sucked in a hot spot nymph, but did not hookup. They looked so bright even in the dim light of the forest. That streamer is one I created to celebrate the Boston Bruins Stanley Cup Championship. That technique came by accident. But it's worth a try at times. I'm thinking I might have to tie up a couple and try them here. They're easy to tie, and would work well for you. It was a enjoyable outing. Take care of the home necessities, Fall is coming and the fishing will be at it's best. Beautiful--fish and experience. Looks like you fooled the King of the Pool. Beautiful fish. The camera seems to be performing well. You like it? So far I'm really pleased with its performance. That's a small stream bruiser! He sure didn't miss to many meals for sure. Brk trt, that's a dandy sized brookie & great photos as well. 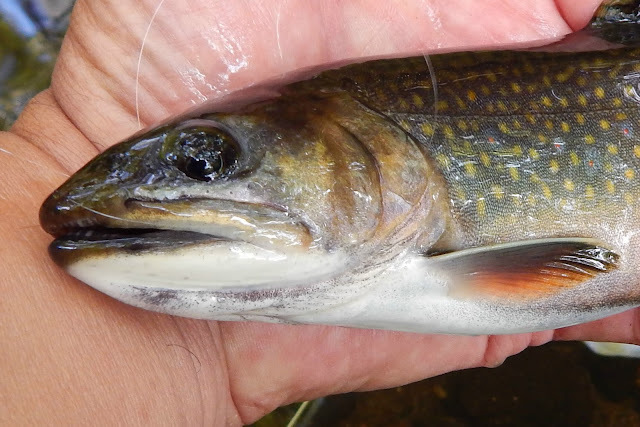 Phil, guys that fish that stream with regularity tell me there are bigger brook trout in there. The flower is a spotted touch me not or orange jewel weed. They are not only beautiful but are great for relieving the itch from poison ivy. 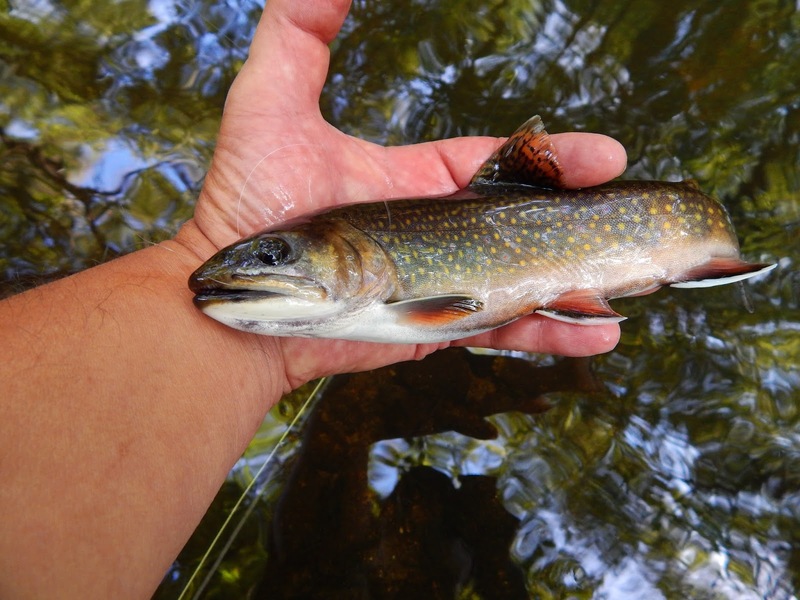 However beautiful it may be the brookie is better....nice post. I knew you would know the flower. And I agree with you about the brookie. It has proven itself, as you well know. I think that yellow wing is what makes it. A few of them lately have been developing a hook jaw. Great fish Alan. 4AM is a good time of day.. I usually start my days a little later, but once and awhile I make a 4am start.